Happy to Announce that We Are Now a Certified B Corporation! The ultimate mission for Giving Assistant has always been to do good, give back, and be better. …but to genuinely make a positive impact in the world. Yet, writing an earnest mission and slapping it on our website wasn’t enough, we knew that our growing company eventually needed to be held accountable for what means the most to our team. This is why we are proud to finally announce that Giving Assistant is officially certified in the field of doing good! But it wasn’t an overnight process. In fact, you could say that the journey began when we decided to launch a social enterprise; we had to spend years building a company that was even B Corp worthy. Take a look at the goals of B Corps, the process of becoming certified, and how Giving Assistant meets the requirements with excellence. The Giving Assistant team and the trash collected after cleaning up Ocean Beach. Businesses should compete not only to be the best in the world, but to be the best for the world. All business ought to be conducted as if people and places matter. World business leaders must realize that everyone is dependent on each other for the well-being of our global community and natural resources. A company’s products can and should benefit society in their production, practices, and profit. The first part of the process is called the B Impact Assessment. This assessment measures a company’s positive impact and sustainability. Once this initial test is complete, businesses receive a detailed score report that shows their strengths and weaknesses. If their score is high enough, B Lab verifies their answers to make sure that they are accurate. And, if all goes well, a company is eligible to become a B Corp. Even after getting certified, a company must demonstrate that they are still worthy of the title. Every two years, all companies must get re-approved through a concise version of the initial assessment. Additionally, 10% of companies are randomly selected for an extra check up each year. All of this goes to prove that being a B Corp is not only an honor, but also a responsibility. 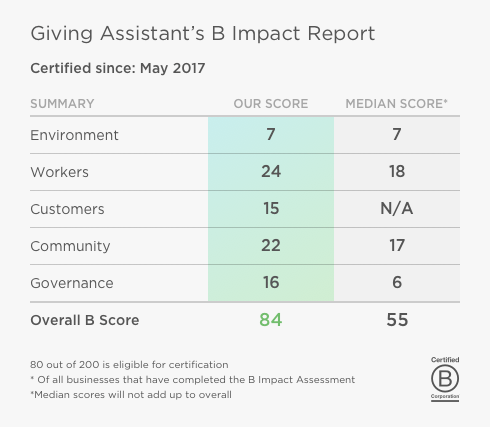 In May of 2017, Giving Assistant passed the B Impact Assessment on the second try and went through all of the required steps to become a B Corp! The process was long and filled with both successes and failures. It took over a year for us, and we had to formalize many of our unwritten policies. But in the end, here’s how our scores stacked up against other companies that took the test. We scored 24 in the area of employee treatment, where the average applicant scores 18. Our governance earned us a score of 16, 10 points higher than the average. In the community category, our score of 22 beat the average score of 17. We offer health benefits and stock options to 100% of our employees. We hold quarterly Fun Days and corporate volunteer activities. Every employee has the ability to work-from-home on Fridays. Our services are an easy way for customers to save money. We offer benefits for shopping on a wide variety of stores, which lets every consumer get involved. We help people get more involved in their global community by making a positive impact when they shop. Through Giving Assistant, our users had the ability to donate over $250,000 to Zidisha, which has allowed them to fund over 9,000 microloans in developing countries. Our users have donated over $17,000 of funds to Camp Kesem, an organization that provides a summer camp for kids whose parents have cancer. Giving Assistant shoppers gave more than $15,000 to Pencils for Promise, allowing underdeveloped communities to build proper schools for their children. Our offices are located in a Platinum LEED certified skyscraper. We recently switched from paper checks to e-checks, drastically reducing our carbon footprint. Much of our donations go toward responsible nonprofits that are good stewards of the environment and natural resources. Considering all that goes into becoming a B Corp, the Giving Assistant team is incredibly proud of our progress. It is an honor to be considered part of this elite group, and we work every day to keep up our positive impact and reach even more communities around the world. Thank you for being part of our success!